A-National Limousine utilizes the latest model Ford E-Series XLT Wagon because of its popular and impressive capabilities. Whether it’s accommodating up to 15 passengers, including providing ample cargo space for their luggage or gear, or 10 passengers with cargo space for 6-10 large bags the E-Series Wagon is up to the task. Our vans are equipped with reading lights, rear climate controls and privacy tint for added comfort. 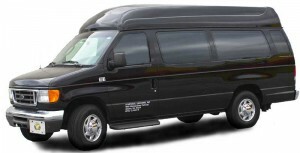 This black beauty is ideal for small groups traveling in the utmost comfort, luxury and safety.